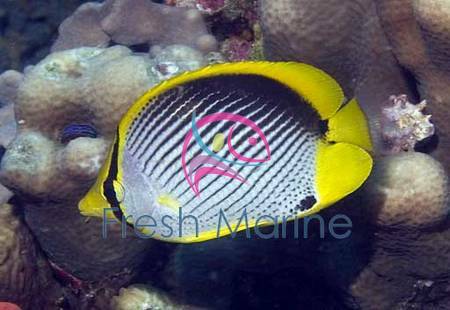 https://sep.yimg.com/ay/yhst-33477391359232/black-back-butterfly-fish-chaetodon-melannotus-melannotus-black-backed-butterflyfish-6.jpgBlack Back Butterfly Fish - Chaetodon melannotus - Melannotus Black-Backed Butterflyfish ModeratePeaceful55 Gallon5.9 inchesNoCarnivore, ClamIndo-PacificChaetodontidaeSmall 1" - 2"
Black Back Butterflyfish, Chaetodon melannotus, is often found living on or around the reefs of the Indian and Pacific Oceans as well as the Red Sea. Members of the genus Chaetodon make gorgeous inhabitants of a fish only aquarium. Soft Corals and most Invertebrates should do fine with the Butterflyfish, but it may likely decimate Stony Corals, as they are a part of its natural diet. Peaceful or non-aggressive tankmates are recommended to reduce stress on the Butterfly. When Butterflyfish are first introduced to the aquarium, they may refuse to eat. Should the fish continue this behavior for three or more days, live food should be offered (if not from the beginning). Food soaked in a garlic product will often entice the Butterfly to eat. Another useful method to encourage some Butterflyfish to eat is to place their food inside of a coral skeleton. Groupings of Butterflyfish can be introduced simultaneously in the same aquarium, making a stunning display. It is best to make sure that the fish have plenty of aquarium space each when adding a group. Live Rock and multiple places to hide also helps to reduce stress in a group introduction situation. Social Behaviors: This fish is notoriously difficult to keep. It is recommended to try a different member of the family before trying their hand at these. Maximum Size: Black Black Butterfly Fish can grow to 6 Inches. Minimum Tank Size: The Black Back Butterfly prefers a tank of at least 60 gallons with plenty of places to hide & swim. Habitat: Indo-Pacific: Red Sea and East Africa to Samoa, north to southern Japan, south to Lord Howe Island. Throughout Micronesia. Feeding and Diet: Omnivorous. Small aquatic invertebrates such as Mysis shrimp and brine shrimp, live or frozen; supplement these with vegetable matter, including algae. Breeding: The Black Black Butterfly Fish is an egg-scatterer.